As I warned, that required a bit of cherry-picking. Several other polls of New Hampshire have been released since the first debate, and they have Clinton ahead by margins ranging from 6 to 11 percentage points — a safer margin than the MassINC or Suffolk polls show. New Hampshire is also one of the few swing states where Trump has spent more on advertising than Clinton — a deficit that the Clinton campaign could counteract if it feels as if the state is in jeopardy. But as far as our model is concerned, the outcome in New Hampshire is more uncertain than in the other Clinton firewall states. Let me explain what I mean by that. 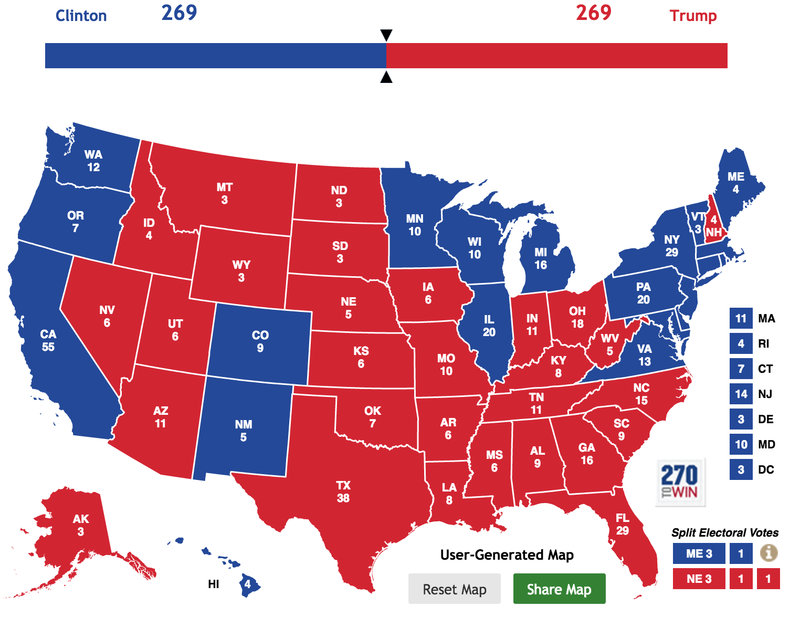 Trump’s chances of winning each state are determined both by how far ahead (or behind) Clinton is, and by how much uncertainty there is in the forecast. Compare Pennsylvania and New Hampshire, for example. Our polls-only model shows Trump as being ever-so-slightly closer to Clinton in Pennsylvania (where he trails her by 7.4 percentage points in our forecast) than in New Hampshire (7.6 points). But it gives Trump a somewhat higher chance of winning New Hampshire (17 percent) than Pennsylvania (11 percent). Where can Trump break Clinton’s firewall? That’s because it assigns more uncertainty to the forecast in New Hampshire. In our model, uncertainty is determined by four major factors. First is the quantity — and quality — of polling in each state. In most swing states, there’s generally enough polling that this isn’t a major source of uncertainty, although some, like Iowa, Minnesota and Arizona, could use more data. There’s plenty of polling in New Hampshire, however, if not quite as much as in states like Pennsylvania or North Carolina. The second factor is the disparity between polling and demographics in each state. Where these are misaligned — as in Nevada earlier in the year, where demographics and voting history implied that Clinton “should” have been ahead, but polls showed her trailing — there’s more uncertainty in the forecast. This isn’t really an issue in New Hampshire, however. Instead, the numbers are in pretty strong agreement there, as our adjusted polling average has Clinton ahead by 7.7 points, while our demographic forecast has her up 6.5 points. But the third and fourth factors do contribute to uncertainty in New Hampshire. One of these is that New Hampshire is a small state; states with smaller populations have larger polling errors. Since 2000, for instance, the states with the largest average error in presidential polls, according to our pollster ratings database, are Hawaii, Delaware, Rhode Island, North Dakota, Wyoming, Alaska and Vermont, all of which have just three or four electoral votes. While there are some other factors to control for,1 the trend is pretty robust even once you account for them. I suspect it’s because smaller states have more homogenous demographics. In diverse states such as Pennsylvania or North Carolina, voting is fairly predictable along demographic lines, and pollsters can correct a lot of sampling problems by using demographic weighting. That’s less true in states such as New Hampshire, Hawaii or Utah, which are more demographically idiosyncratic. If you don’t do a good job of capturing the Mormon vote in Utah, for example, your poll or forecast is going to be way off. The final factor is that New Hampshire is more “elastic” than other swing states. By elastic — the way I’m using the the term is borrowed from economics — I mean that it tends to swing more with the national trends. Specifically, New Hampshire has an elasticity score of 1.19, which means that for every point that the national polls move, we’d expect New Hampshire to move by 1.19 points in the same direction. Thus, if there’s a 5-point shift back toward Trump nationally, we’d expect New Hampshire to swing by slightly more than that, by around 6 points instead. Which swing states swing the most? These elasticity scores are calculated based on detailed assessments of each state’s demographics from the 2012 Cooperative Congressional Election Study and the 2008 exit poll. And they get at some of the same concepts that I mentioned above. In Pennsylvania or North Carolina — relatively inelastic swing states — voters are highly bifurcated along racial, religious and other demographic boundary lines. Pennsylvania and North Carolina happen to be swing states because the number of Democratic-leaning groups is roughly the same as the number of Republican-leaning groups in each one. But they don’t actually have all that many swing voters. They tend to be states where turning out your base is more important than persuasion. In New Hampshire, by contrast, there really are a lot of swing voters. In particular, there are lots of middle-class and upper-middle-class white voters who aren’t highly religious and don’t belong to one of the major parties. Those voters are often torn in their presidential vote in this and in other elections. Sure, some of these scenarios can get obscure. If Clinton wins Florida or North Carolina — or loses Pennsylvania — New Hampshire’s four electoral votes will look measly in comparison. But according to our voter power index, New Hampshirites have the most influential votes in the country in both the presidential and the contest for control of the U.S. Senate. Overall, Clinton’s chances of winning the election are 86 percent in our polls-only forecast and 82 percent in polls-plus, little changed from recent days. For instance, a lot of the states I just mentioned tend to be noncompetitive in presidential elections, and noncompetitive states can be harder to poll.